It starts with a threat. Escalates to a slap. Always involves a promise for change. And all too often ends in a woman’s death. This needs to stop. So writes investigative journalist, Sarah Ferguson on the on The Drum. The first episode in her two-part series ‘Hitting Home’ aired last night. (If you haven’t seen it, it’s on iview.) In it, Ferguson delves into the lives of women living with the effects of domestic violence: the stress, the fear, the trauma, the court case, the injuries. Over the course of a single episode, embedded within a single refuge, we hear stories of criminal violence so shocking and horrific it’s hard to not be brought to tears. Women willing to jump from moving cars, they’re that desperate to escape. Husbands trying to run over their wives. Young women told they’re worth nothing from the men who are suppose to love them. A woman’s jaw broken. A child scared for his safety. Tracking devices on vehicles. Facebook stalking. A gun drawn and fired. It’s harrowing. It’s horrific. And it’s all to close to home. NSW Police Commissioner Andrew Scipione, told ABC news today, “The reality is last year we attended 28,000 or so domestic assaults. There’s been 27 women killed in NSW so far this year. Where will it end?” We may never bring an end to violence. It’s simply unrealistic. But how are things this bad? According to the Counting Dead Women project by anti-sexism group Destroy the Joint, which counts all victims of violence regardless of the relationship involved, at least 78 women have died this year. Let that sink in. 78. Tara Brown, 24. Jody Meyers, 20. Brittany Harvie, 22. Salwar Haydar, 45. Jackie Ohdie, 27. June Wallis, 32. Daniela D’Addorio, 35. Tara Costigan, 28. Fabiana Palhares, 34. Nikita Chawla, 23. Dianne Chi, 22. Ainur Ismagul, 55. Adele Collins, 39. The national statics say at least one woman will be murdered every week. Every three hours another woman will be hospitalised: with Indigenous women 43 times more likely to end up in hospital because of injuries sustained during a domestic violence assault. According to ‘Hitting Home’ police are dealing with 650 domestic violence events every day. That’s one every two minutes. Last year we wrote an article called ‘Breaking the Cycle’. In it we described the cyclic pattern of domestic violence: the way you feel emotionally and physically trapped. You see that’s why women stay. They feel trapped. When we ask ‘why didn’t she just leave?’ We negate just how insidious emotional and physical abuse can be. The way it begins, presenting itself in mere glimpses of passive aggression. The way abusers progress to control and manipulate the emotional, financial and physical state of their partners. The way it escalates to more serious forms of physical, emotional, financial and sexual abuse. Domestic violence rarely revels itself immediately. It takes its time. Whether it’s because you don’t know what’s available to you; you’re anxious about financial security; or, you’ve been emotionally pummelled enough you feel worthless, escape can feel impossible. Sometimes you just hope it gets better. At the end of the day, Australia has to step-up and realise how endemic the problem of domestic violence is. And we need to stop relying on victims to solve it for us. 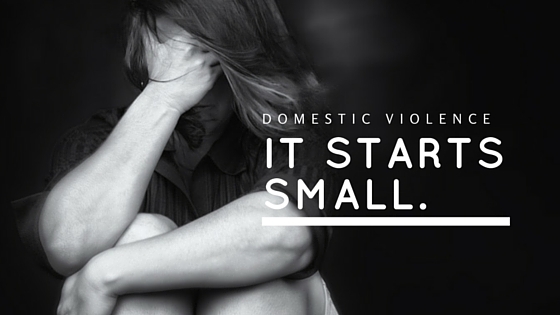 As a family law firm, we see domestic violence almost every day. Often it’s unreported and they come to us during the divorce and property settlement proceedings. But the end of the marriage or the relationship doesn’t always signal the end of the abuse. The women in our offices are often the lucky ones. They’re the ones who have had the ability to leave. Not every woman will be as lucky. On today, White Ribbon Day, we call on everyone to take stand against men’s violence against women.